From the Preface by Ted Gioia:All of these musicians fought their way back over the next decade, and their success in re-establishing themselves as important artists was perhaps the first signal, initially unrecognized as such, that a re-evaluation of the earlier West Coast scene was under way. Less fortunate than these few were West Coasters such as Sonny Criss, Harold Land, Curtis Counce, Carl Perkins, Lennie Niehaus, Roy Porter, Teddy Edwards, Gerald Wilson, and those others whose careers languished without achieving either a later revival or even an early brief taste of fame. Certainly some West Coast jazz players have been awarded a central place in jazz history, but invariably they have been those who, like Charles Mingus or Eric Dolphy, left California for Manhattan. Those who stayed behind were, for the most part, left behind. The time has come for a critical re-evaluation of this body of work. With more than forty years of perspective--since modern jazz came to California-we can perhaps now begin to make sense of the rich array of music presented there during those glory years. But to do so, we need to start almost from scratch. We need to throw away the stereotypes of West Coast jazz, reject the simplifications, catchphrases, and pigeonholings that have only confused the issue. 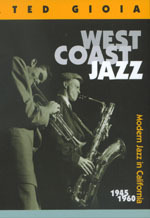 So many discussions of the music have begun by asking, "What was West Coast jazz?" --as if some simple definition would answer all our questions. And when no simple answer emerged--how could it when the same critics asking the question could hardly agree on a definition of jazz itself?--this failure was brandished as grounds for dismissing the whole subject. My approach is different. I start with the music itself, the musicians themselves, the geography and social situation, the clubs and the culture. I tried to learn what they have to tell us, rather than regurgitate the dubious critical consensus of the last generation. Was West Coast jazz the last regional style or merely a marketing fad? Was there really ever any such thing as West Coast jazz? If so, was it better or worse than East Coast jazz? Such questions are not without merit, but they provide a poor start for a serious historical inquiry. I ask readers hoping for quick and easy answers to approach this work with an open mind and a modicum of patience. Generalizations will emerge; broader considerations will become increasingly clear; but only as we approach the close of this complex story, after we have let the music emerge in all its richness and diversity. By starting with some theory of West Coast jazz, we run the risk of seeing only what fits into our theory. Too many accounts of the music have fallen into just this trap. Instead, we need to see things with fresh eyes, hear the music again with fresh ears. Ted Gioia, one of the founders of Stanford University's Jazz Studies program, is also the author of The History of Jazz (1997) and The Imperfect Art: Reflections on Jazz and Modern Culture (1988; winner of the ASCAP Deems-Taylor award). He has made recordings as a jazz pianist and has produced recordings of the work of younger west coast musicians.